Tradition beautifully preserved, made to last lifetimes. 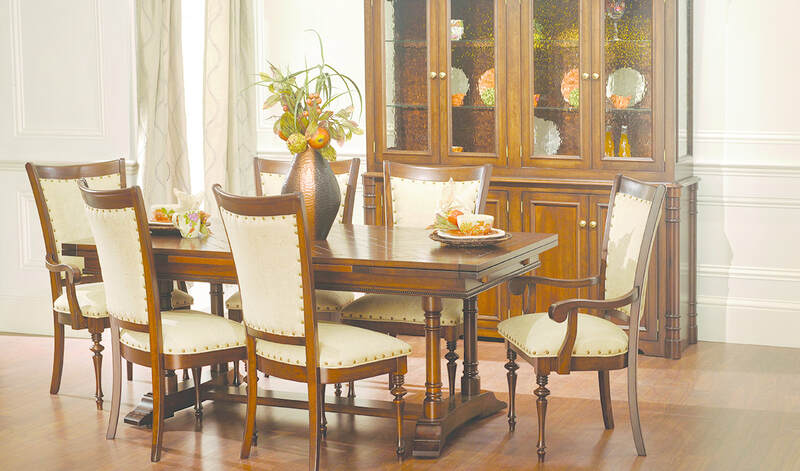 Order as is or custom design a piece of fine furniture to fit your style and home! You can choose from 9 different hard woods, 40 different beautiful stains and a catalog full of different hardware. The possibilities are endless! 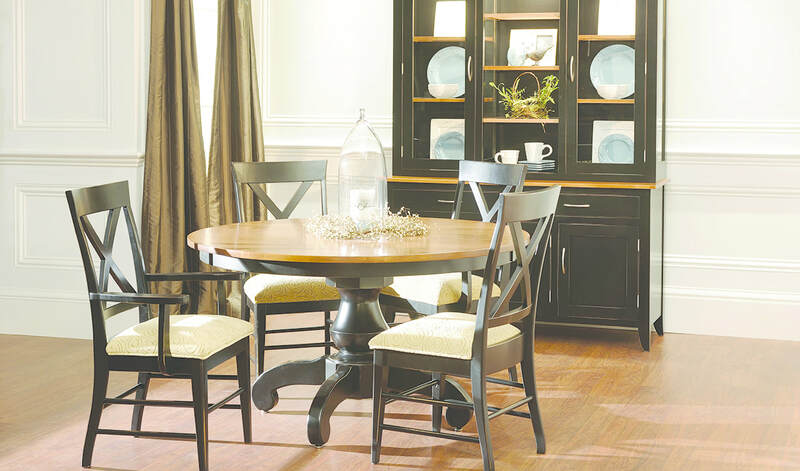 Hardy furniture for today's lifestyles, with deep, rich finishes and classic design. Elongated ladder-back chairs provide drama and add visual interest. Clean, sophisticated and upscale -- but still comfortable. This is a collection for someone who loves to stay up on the latest trends, but also appreciates character that never goes out of style. High table can be ordered with a unique butterfly self storing leaf option. 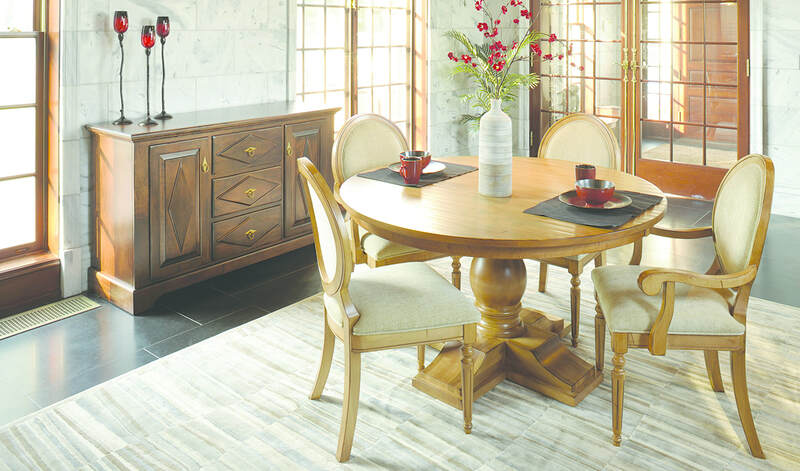 An upscale spin on the American Arts and Crafts movement, which focused on durable construction techniques and handmade details -- including stunning curves and clean lines. 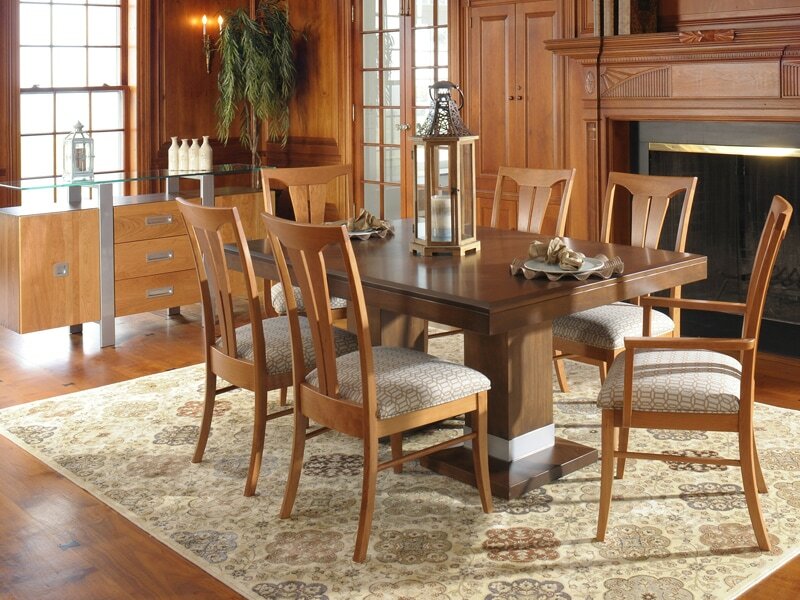 A dining set with true presence, it offers casual West Coast style done with flair. The Riviera is a modern blend of wood, metal, and glass. 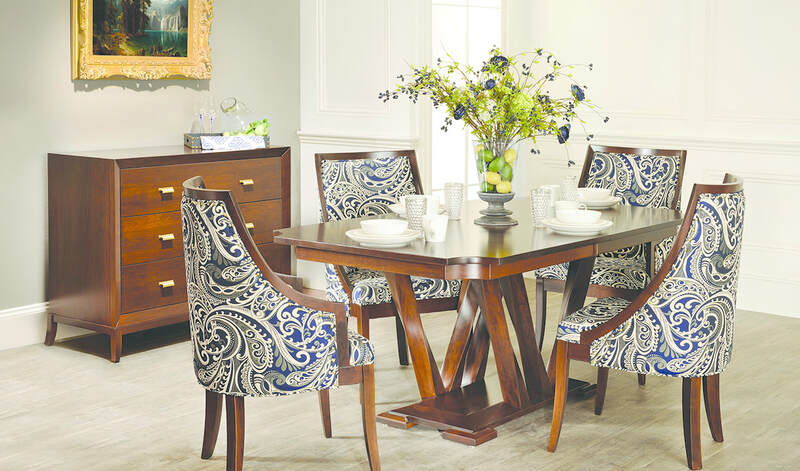 Reminiscent of fine art, the Riviera will have your friends and family swooning over its handsome details. 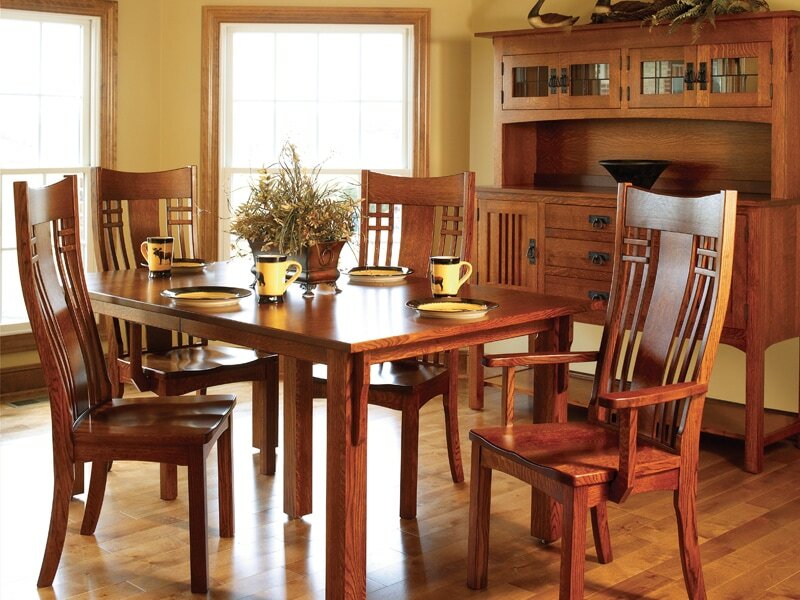 The Tavern table and chairs are the worlds best Windsor chairs and a Valley Shaker table with a turned leg. 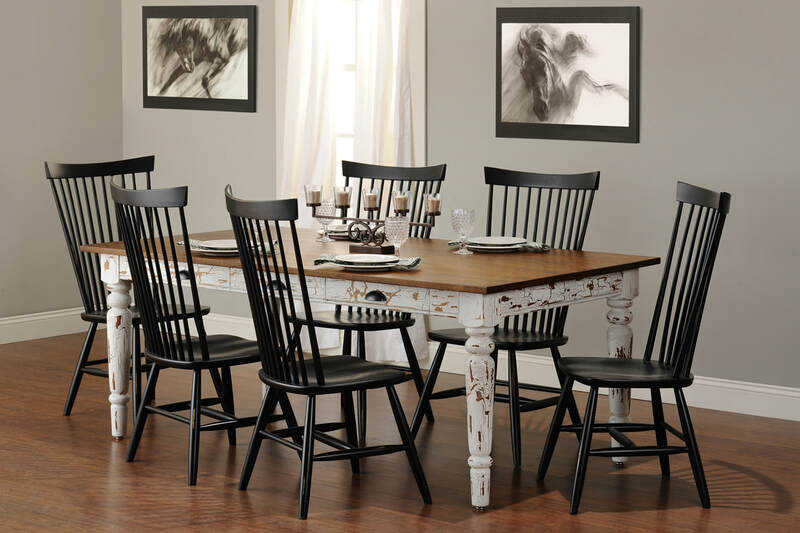 Add a little distressing and two tone stain to the table and you have a really authentic look of a colonial tavern. Some of the rustic features are softened, yet it maintains that classic air of simplicity. If you're looking for a hint of the classic look, but with more versatility for your own interior design, this is the answer. Take a relaxing trip to the Italian countryside. It's a place where native materials and practical designs serve furniture that creates an atmosphere of good friends and good times. Shaker styling has withstood the test of time. Simple, tapered lines and a clean, contemporary look guarantee instant satisfaction. With flexibility in both traditional homes and modern Manhattan high-rises, Shaker becomes a lifetime investment. Simplicity with a twist. The Warren Collection will give you the refreshing minimalism you need while maintaining some unique design variations. 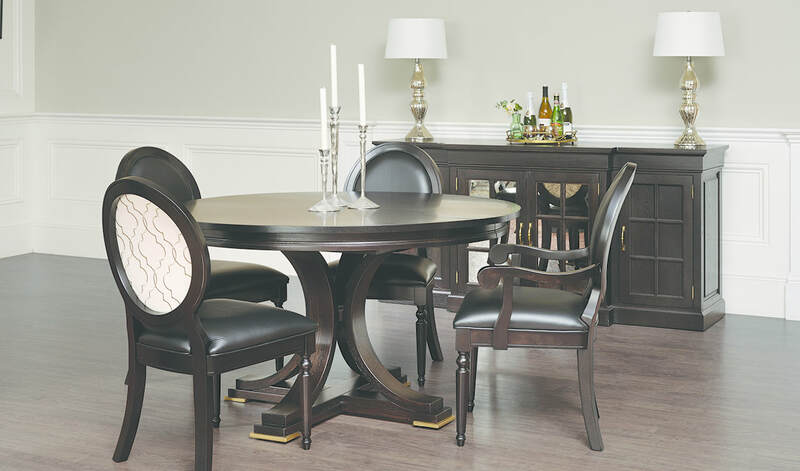 The Uptown set provides the epitome of luxurious dining. 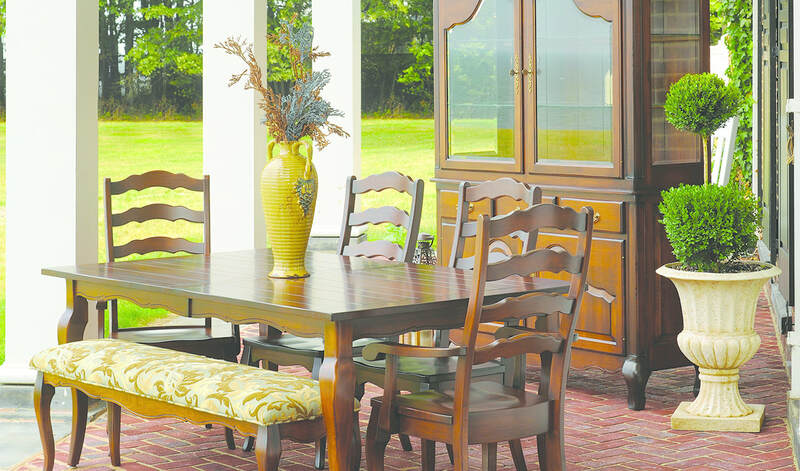 if you have exquisite tastes, and want to entertain like-minded people, then you'll want to think about buying the Uptown furniture. The solid brass hardware, the twisted legs, and the awesome comfort of the chair are mere indications of your fine taste. The only problem you'll have is that your friends wont want to leave after dinner! Some things in life are so good they need to be recreated. 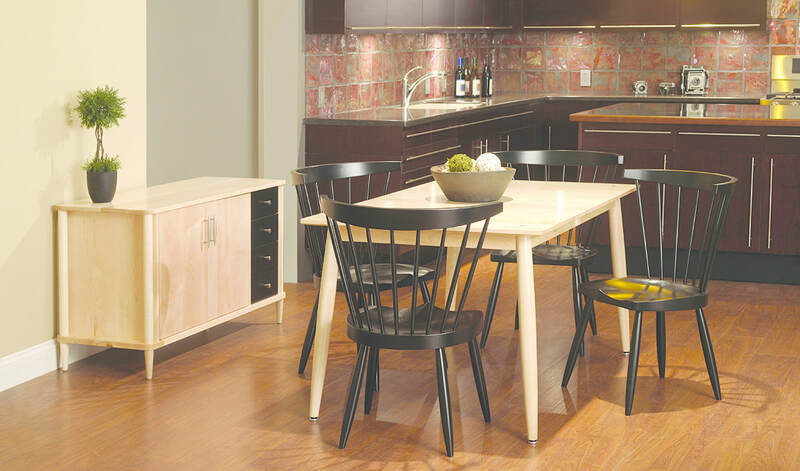 The two-tone finish option and the raked legs give indication of times past, while the metal base, innovative chair design, and the sleek, oversized pulls have a uniquely modern look. 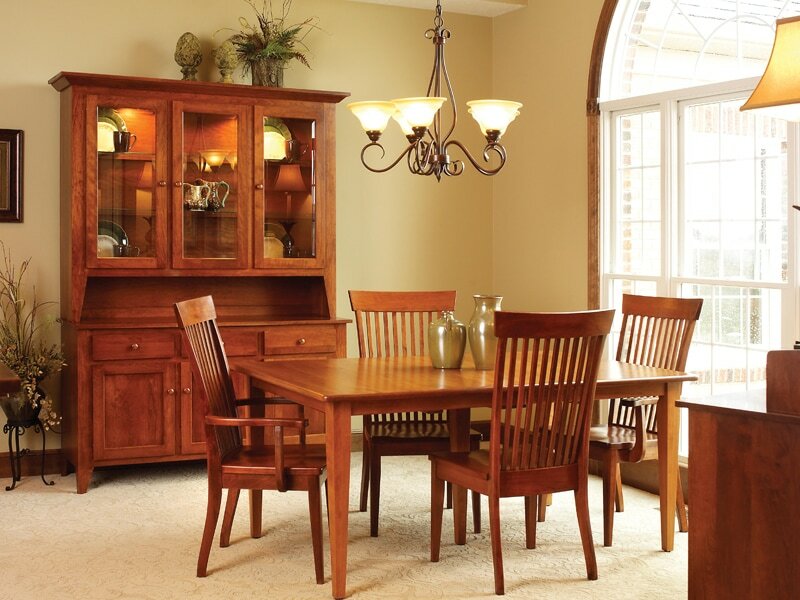 The Walnut and exotic Maple options give you an elite, high quality option in a world of "throw-away" modern furniture. Natural and hand hewn, the Williamsburg Collection is for everyone who prefers loafers to dress shoes, and who appreciates the warmth and sincerity that solid wood furniture brings to a home. 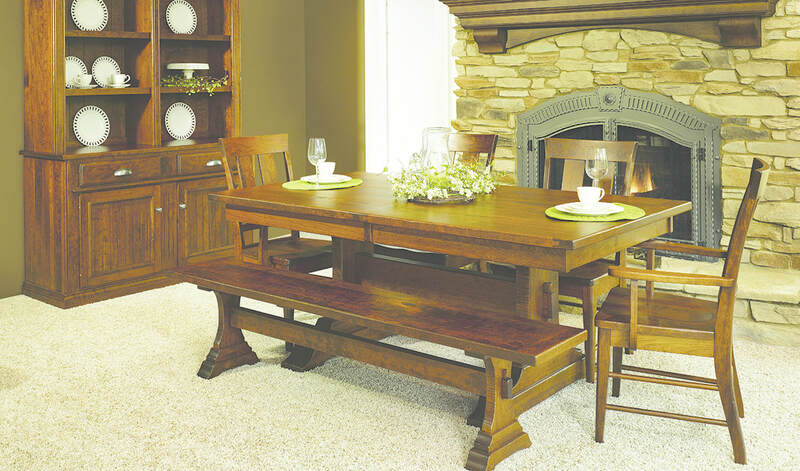 Visit an aged, ivy-wrapped stone farmhouse on any given day and you might find a table quite like the McKinley. Built sturdy for everyday use with details that give each piece its own personality. Beautiful things happen when varying colors and textures come together...a feat perfectly exemplified in this room setting. 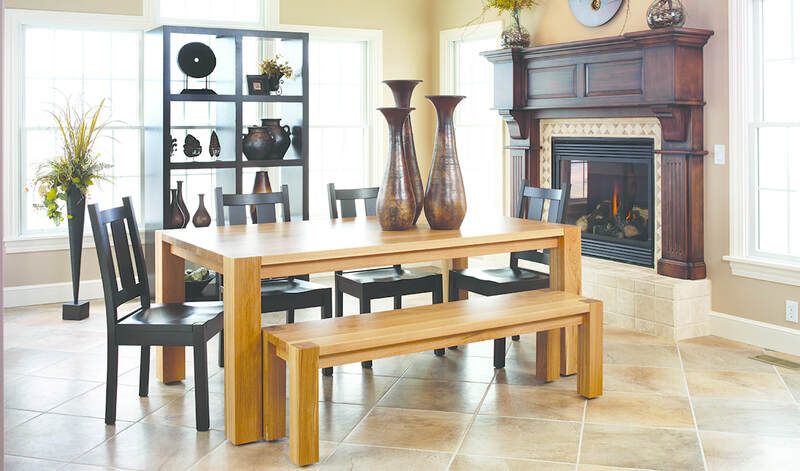 The x-base Parker table looks great with eclectic mix of seating. The full overlay doors and drawers add great detail. The Branson Collection is an eclectic mix of mid-century modern and the millsawn, almost industrial features of a working table. Bold, straight lines blend well with the brass bolts and chunky legs to create statement pieces that will be the talk of the town. Traditional? YES! Trendy? YES! It's the perfect blend of trend and class. 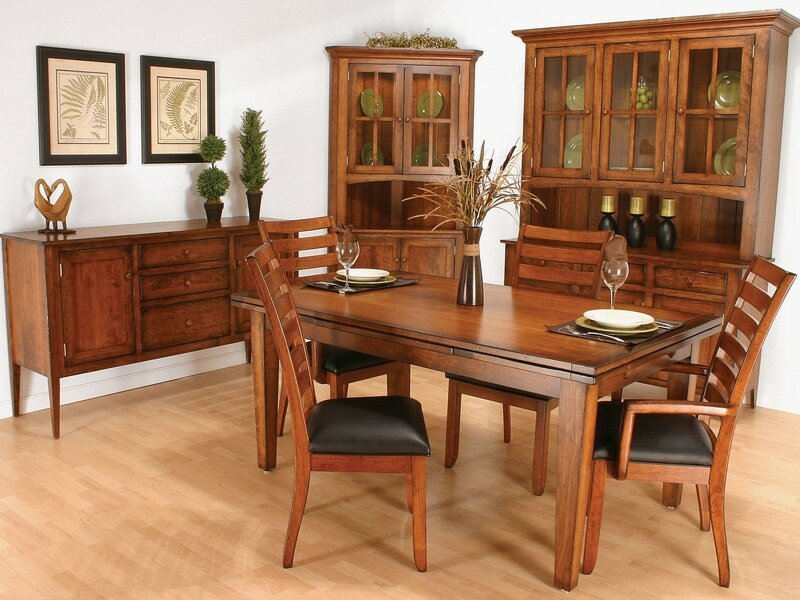 Add the built in wine rack and stemware holders and you've got a splendid setting for entertaining. The brass accents and aged mirror are sure to create conversation. 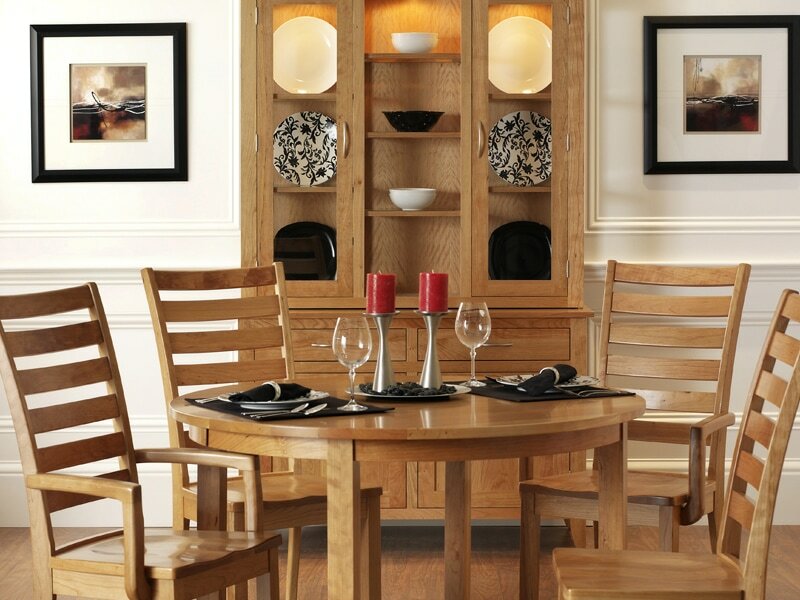 The Whitby set has scale that isn't found in most other dining sets. the large exaggerated turned legs, the majestic captains chairs, and the tall stately looking cabinets will do a great job of filling a large room. 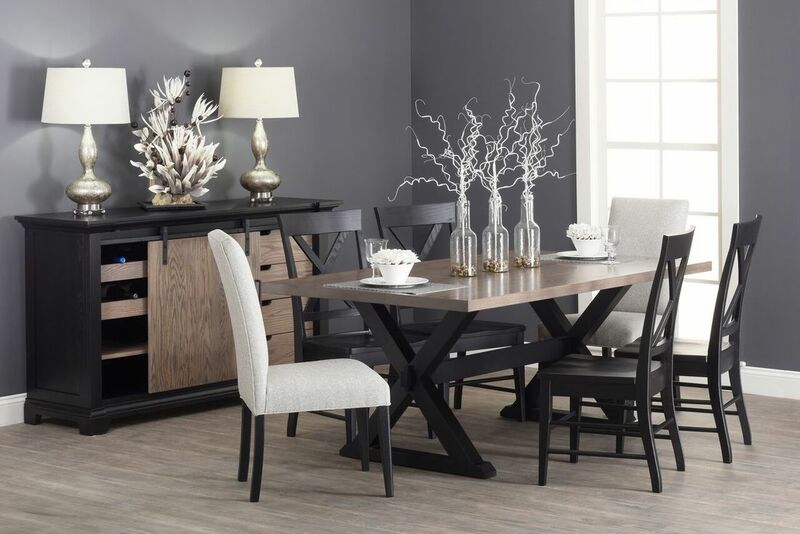 An x-base farmhouse table, x-back chairs, and a sliding door in the buffet are the standout features of the Rochester Collection. 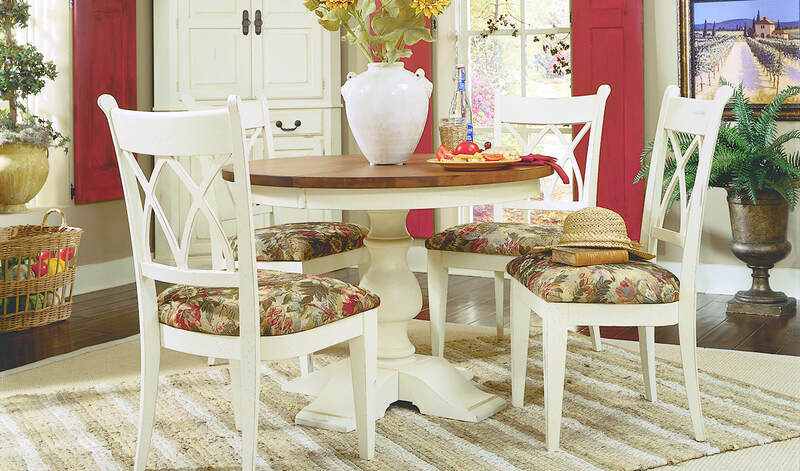 A two-tone finish and upholstered chairs dress up this classic design and take it from functional to fashionable. 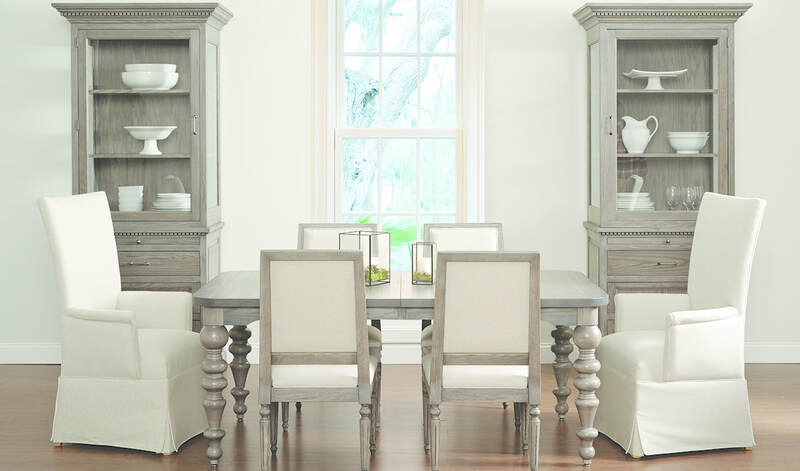 Like the french country houses the Chateau was named for, this collection is instantly rustic and welcoming. Fill the table with freshly baked breads and cheese and wait for your friends to come knocking! Inspired by the French countryside, this style is sure to transport your imagination to lavender feilds and warm sunshine. Let it express your relaxed approach to good living. Oversized and rugged, this bold piece is deceptively simple. 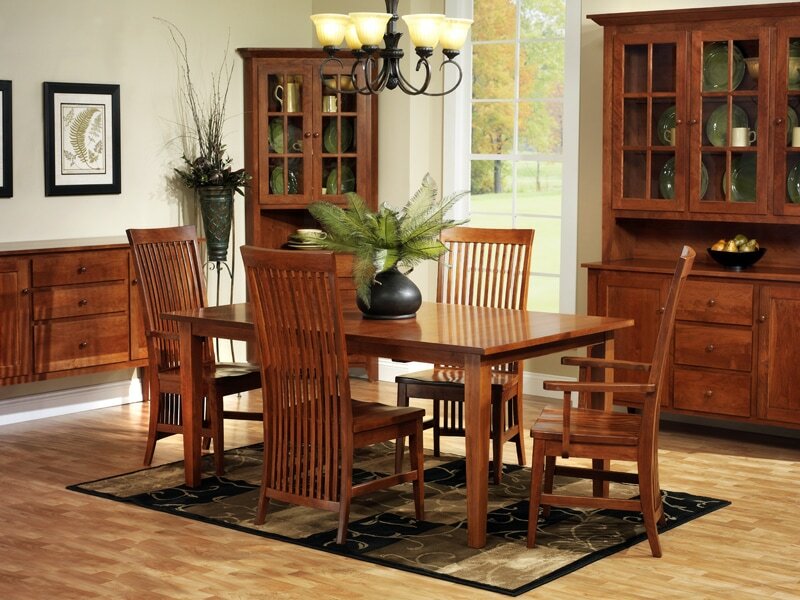 With clean lines and understated elegance, it can anchor any decor-from rustic simplicity to upscale sophistication. The the breezy opulence of the eastern seaboard, give it a subtle cottage feel, and it would look a lot like this. 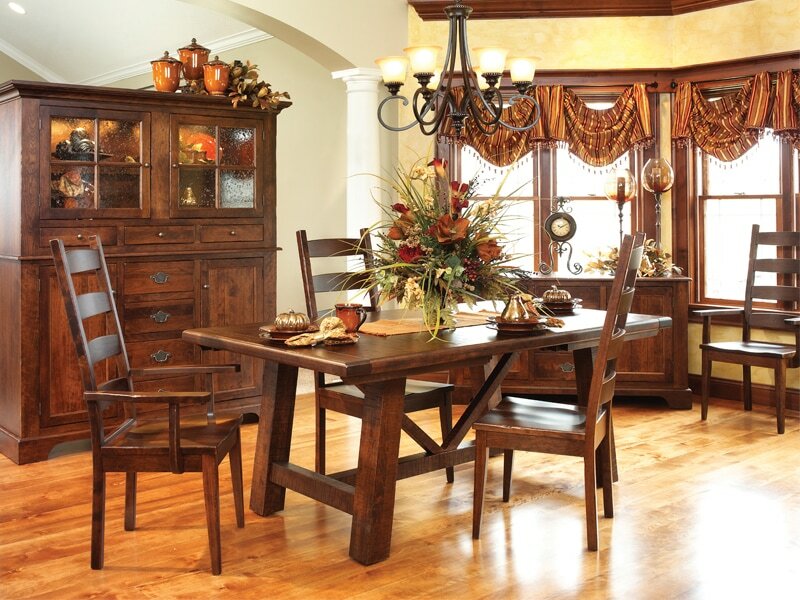 The barn door X on the chair backs provides a cozy, inviting touch, but the rest says informal sophistication. It's about upscale style that's fun and functional. 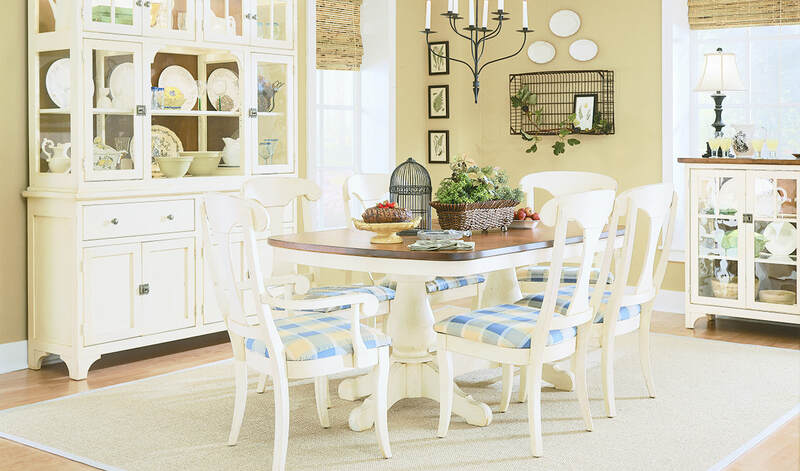 Perfect for that small breakfast nook you've been dreaming about! 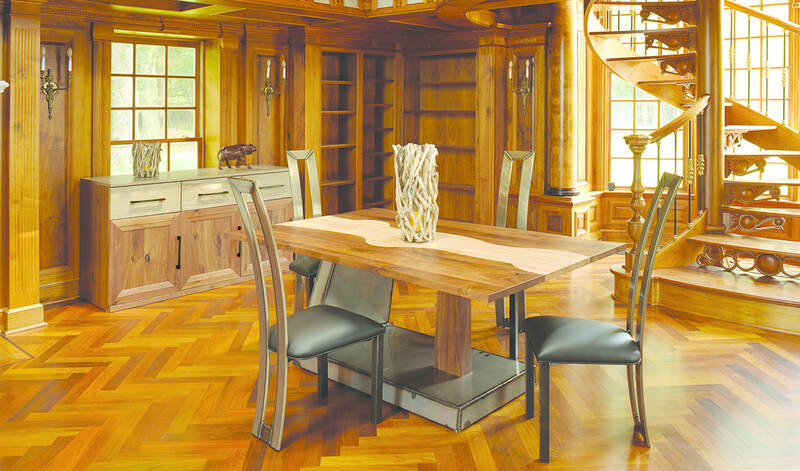 The Florentino Table is small enough to fit into a corner or small kitchen, but handoms enough to make a big impact. Cross-back Chairs add visual appeal and a Florentino Corner Hutch adds extra storage and brightens up an unused corner space! An evening of card games or an afternoon tea is found to be best around the accommodating Grand Mesa. Mission style helps this collection bring a little adventure to any space. The montecito caters to those with refined tastes, who appreciate when beautiful things are also well made. Features such as the applied molding on the hutch and cross pattern on the table top make this collection as distinguished as yourself. You'll automatically want to gather your family and friends together for dinner. 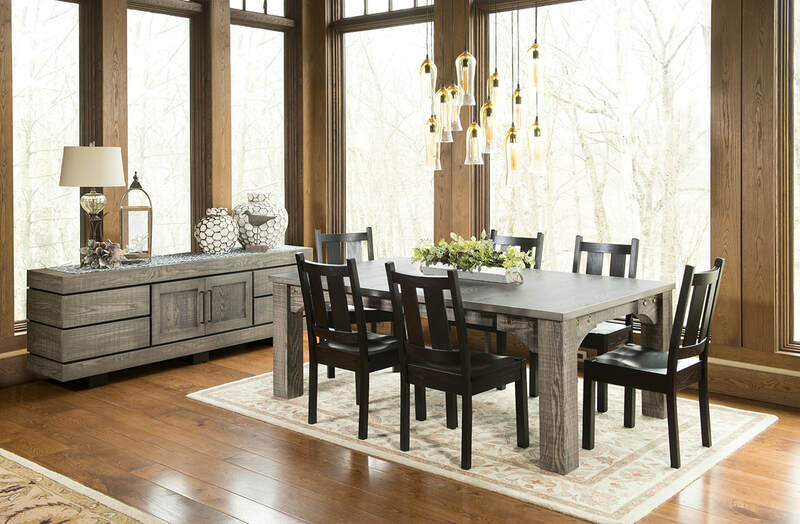 The warmth of the well-lit glass cabinets and the size of the table work together to make your dining room a place to create memories. 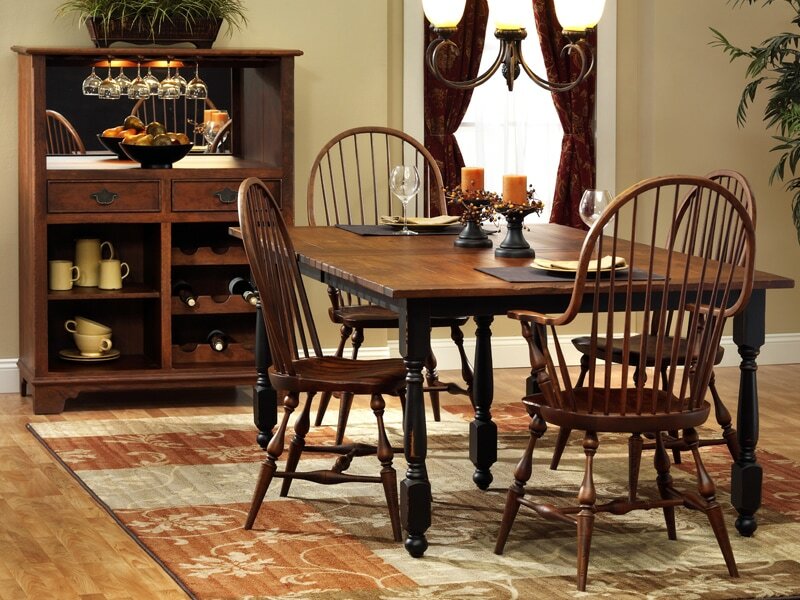 Rustic and homey, bring the feel of a country farmhouse to your modern lifestyle. Be reminded of a simpler time, but enjoy all the grace and beauty your style demands. 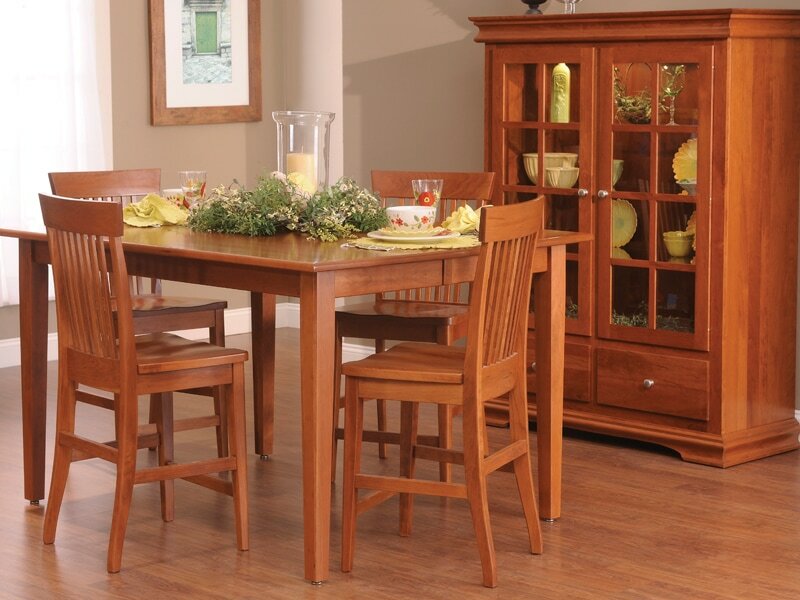 Designed to provide a high quality collection for casual, condo-sized dining furniture. Simple, clean, and comfortable. 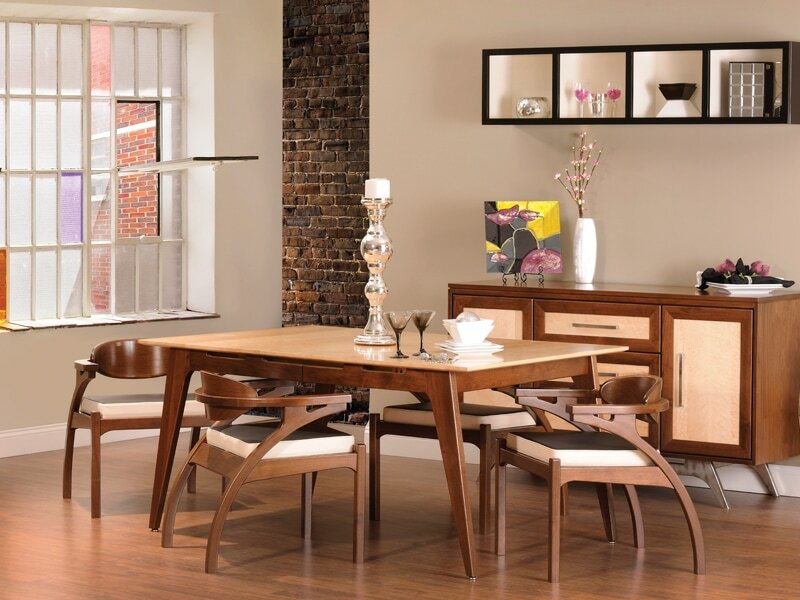 Even though we refer to this as modern set, there's no denying a hint of it's mid-century past. It's like a gesture to an era that taught us how to build fun furniture. 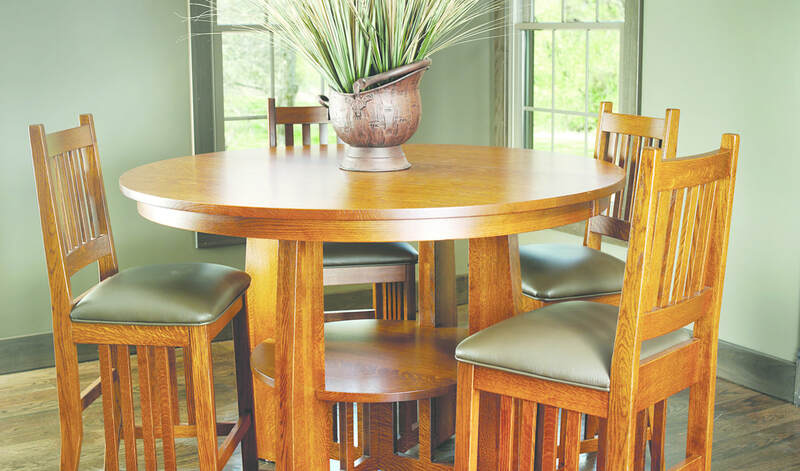 All of our tables and chairs can be built in counter top or bar top height as well. Remember there are 40 different stains and over 9 different types of wood to choose from. You can customize everything. Hutches have a wide selection of doors, drawers and hardware to choose from. If you like a table of one design but the leg from another so be it! We will walk the project through and deliver exactly the piece that you design.